One of the earliest, and most common, uses of barns in the San Juan County was the storage of hay. The Hudson’s Bay Company, along with early settlers, used naturally occurring pasture lands (“prairies”) for grazing their livestock, and sometimes cut native grasses in swampy areas for winter hay. Soon, however, they began cultivating pastureland by planting grasses for hay. Early homestead records often mention that a certain area of land (20 acres, 40 acres) had been cultivated by the claimant and “planted in timothy”. Timothy grass (Phleum pratense) was the most common grass used by early pioneers in the Northwest. It was first introduced into the area by the Hudson’s Bay Company at their Fort Vancouver outpost, where pastures were often planted in timothy and clover. Timothy grows better in clayey loams than in sandy soils, and is well adapted to cool, humid climates such as the Northeast (where it was first used as a pasture crop) and the coastal regions of the Northwest. Although it is often too rough to be eaten in its growing state, timothy dries well and makes excellent hay. It can be seeded in the fall or the spring; however, less seed (about 3 to 5 pounds per acre) is required at the former time than the latter (10 pounds). Other grasses were later used for hay crops, including bentgrass (Agrostis spp. ), Kentucky Bluegrass (Poa pratensis), tall fescue (Festuca arundinacea), orchard grass (Dactylis glomerata), Annual Ryegrass (Lolium multiforum), and Perennial Ryegrass (Lolium perenne). To improve soil conditions, farmers also planted legumes such as clovers, both red (Trifolium pratense) and white (Trifolium repens), and trefoils, both Big (Lotus uliginosus) and Birdsfoot (Lotus corniculatus). 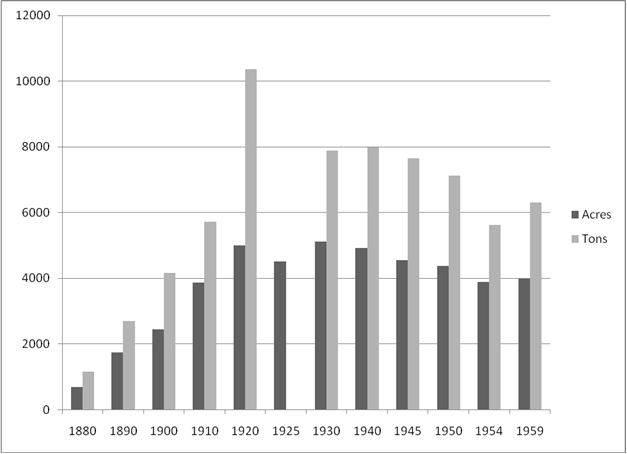 Alfalfa (Medicago sativa) has also been grown in the islands, but not as successfully as other places in Washington. Reed Canarygrass (Phalaris arundinacea), first introduced in the 1920s, is well established in the wetlands throughout the islands. Hay, both “wild” and “tame” (cultivated), was originally harvested “loose” (i.e. cut directly in the field), loaded into wagons, and then driven into a central bay of the barn, where it was forked into the “mows” on either side. 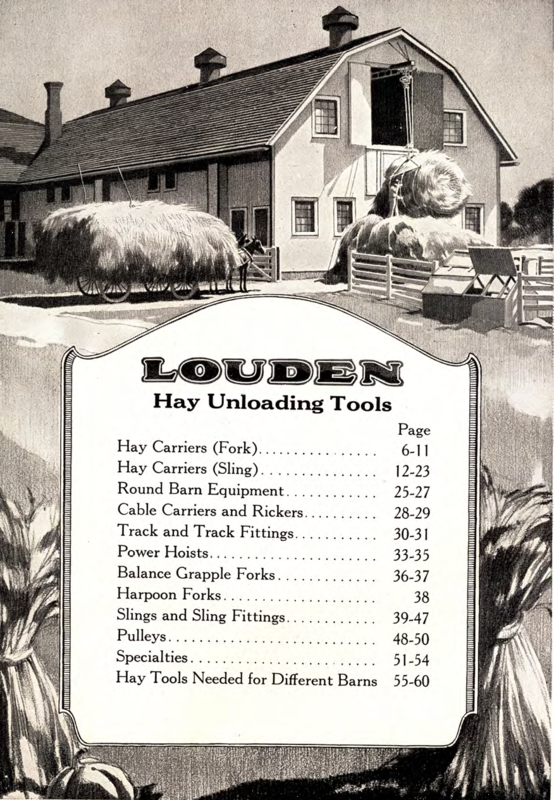 In 1867, William Louden patented the “Louden Hay Carrier,” a mechanical system used to load hay into the mows. This consisted of either a rectangular wooden beam or metal track hung from the underside of the roof ridge, upon which a trolley could be wheeled to position over select areas of the hay mow. Pulleys on the trolley were threaded with ropes that were attached on one end to either hay hooks or slings, and on the other to a draft team (and later a car or truck) to pull it and thus elevate the load. With the load suspended high above the mow or loft, the trolley was wheeled into position and the load released by pulling a trip rope that would disengage the hooks or sling. Hay track systems worked with either center drive or gable end loading; in the former a hay wagon was driven into the center passage, while in the latter the wagon was driven next to the gable and the hay load entered through a hay door near the peak of the gable. After 1900, several companies provided standard equipment for mechanical hay systems. One of the most prominent was the Louden Machinery Company of Fairfield, Iowa. Their models included the “Louden Junior Hay Fork Carrier,” examples of which can still be found in several of the island barns. Another agricultural equipment company was Hunt, Helm, Ferris and Company of Harvard IL, who promoted their “Star Line” of equipment. The width of a hay storage barn is limited by the distribution that can be secured easily from a single hay carrier track. A typical width is 24 feet, and from 32 to 34 feet is the practical maximum width. The maximum economy of storage is obtained in the height; however, the total height should not greatly exceed the width, because of the heavier construction necessary, and the danger of storm damage to higher structures. The length of the building is determined by the capacity requirements. The capacity of loose hay is about 500 cu ft per ton or 4 lbs per cu ft. (Actual numbers are: alfalfa 485; timothy 640; and wild hay 600.) In early hay barns, the mows were piled from the ground up. It was only with the introduction of frame systems that hay “lofts,’ or second stories, were added. 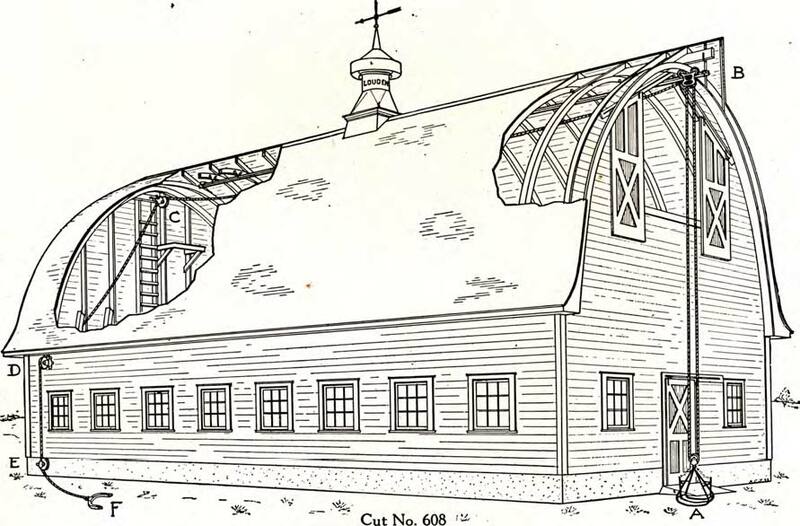 The introduction of truss systems to form gambrel, gothic arched, and bow roofs added more space in lofts, allowing for a greater capacity for hay than older gable roofed spaces. Mechanical hay balers, although invented in the 1930s, were not introduced to San Juan County until after World War II. Originally, they produced a large (100+ lb) rectangular bale held together with metal wires. Baling hay reduces the volume to about one-fourth of the loose weight, and is a more efficient means of storing hay in a barn. At the time of introduction of balers, most barns had second story “lofts” where the bales could be stacked. Farmers used portable steel “elevators”—long metal structures that had a central chain with prongs driven by a motor–to deliver the bales to lofts. In a few instances, ‘handmade’ elevators and conveyors, jerry-rigged out of locally available materials, were built into the barn by inventive farmers. In the early 1950s, Allis Chambers machines that produced small (40-60#) round bales were introduced to Lopez Island (and possibly the others, too).